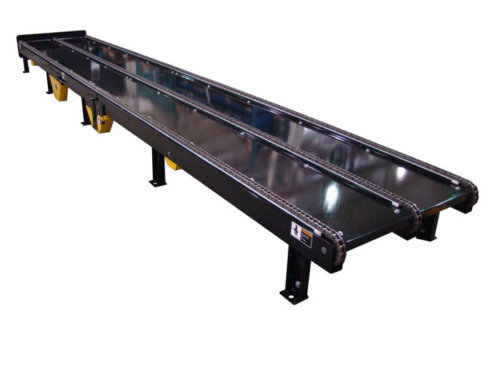 Chain conveyor systems are rugged, durable conveyors used to transport products along a production line. They are suited to many items that wouldn’t typically convey on a roller conveyor. 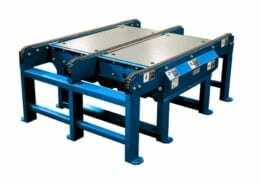 Therefore, typical uses are to move pallets, racks, industrial containers and any products with a sturdy lower surface. 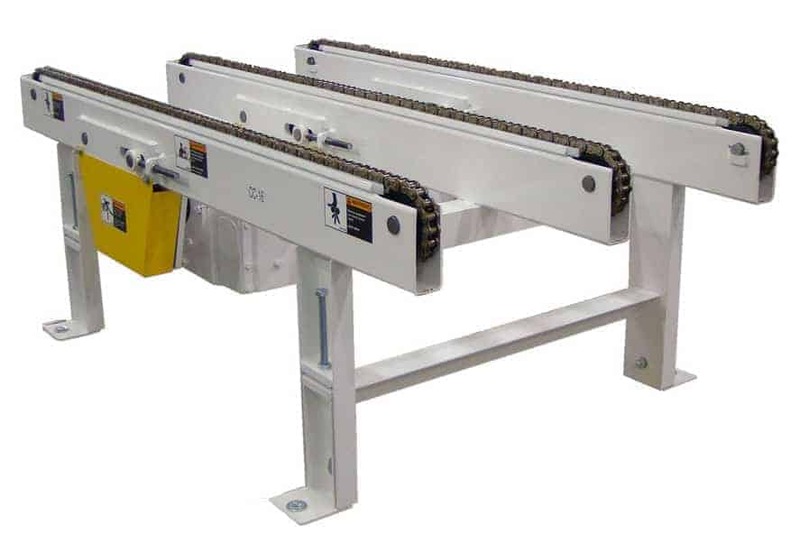 Because chain conveyors are generally very easy to install they usually require minimal maintenance, and integrates easily in systems with CDLR and transfers. 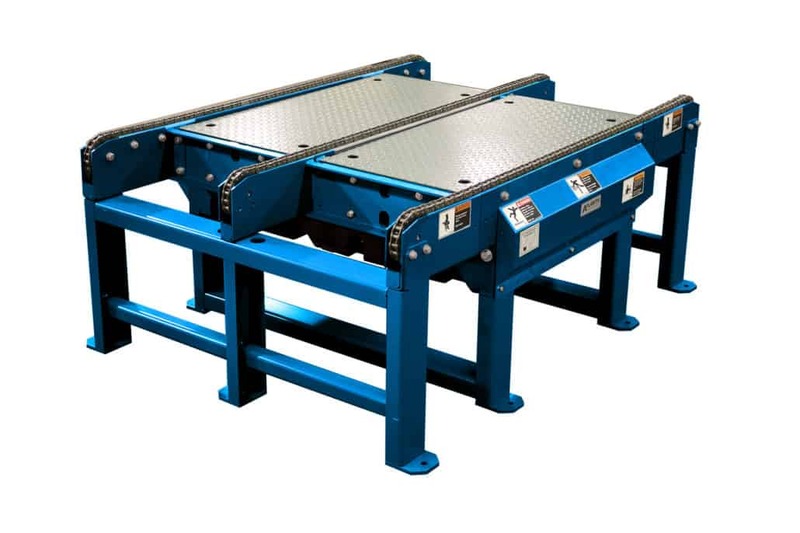 Sometimes they are referred to as a pallet conveyor due to their wide use in transporting wood or steel pallets. In addition, multiple chain options allow for flexibility in applications as well as environments. 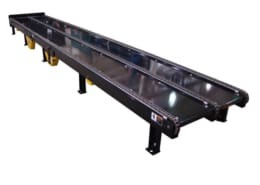 Ultimation is one of the leading chain conveyor manufacturers and can design and engineer custom conveyors, as well as providing fast-ship “off the shelf” chains conveyor designs. 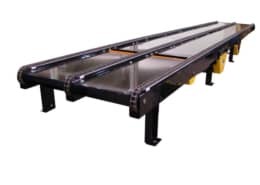 What are good uses of a chain conveyor? Importantly, depending upon the product weight and the product being conveyed, different chain types and tracks are available as well as custom configurations. Capacities typically range from 500 lbs. 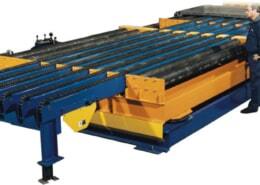 up to 80,000 lbs for the two strand chain conveyor. For lighter loads, UHMW Polyethylene track is used with chain sizes C50, C60 and C80 (up to 3000 lbs.). 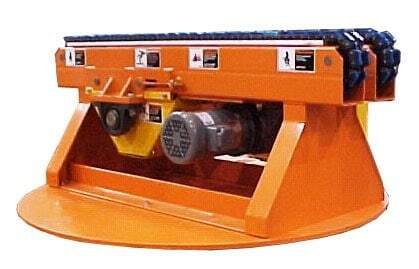 This provides wear resistance, quiet operation and reduces power requirements. Special hardened alloy steel track is used on C80 (3000 lbs. 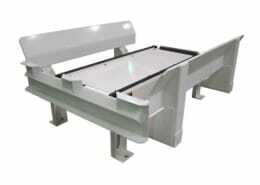 and up), C100 and RC120 chain conveyor sizes for increased load carrying capacity and long life. 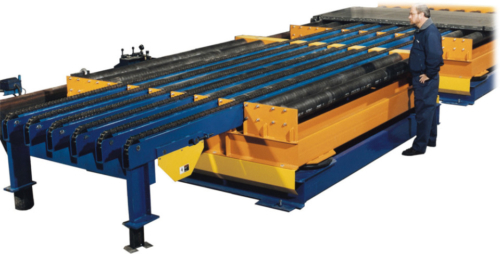 For more information on the types of chain used on chain conveyor systems, follow this link. “C” series, straight side-bar chain on sizes C50 through C100 is used. This flat plate chain reduces product damage and wear compared to traditional roller chain. Transfer chain with non-marring pads assembled to the chain. Glass or painted parts are just some of the products that can be conveyed on this chain. 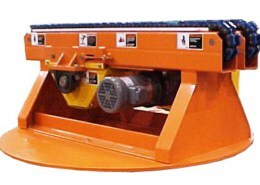 Polyurethane v-belts or flat belts are available for non-marring chain conveyor applications. Center-mounted drive allows chain travel to be reversed. Drive and pinch points are guarded. Need more information? 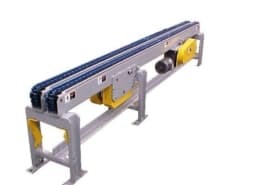 As one of the leading chain conveyor manufacturers our team are happy to receive your inquiry.